NXP Semiconductors has announced the availability of its single-chip solution for multifunction NFC-enabled car keys – the NCF2970, or KEyLink Lite. 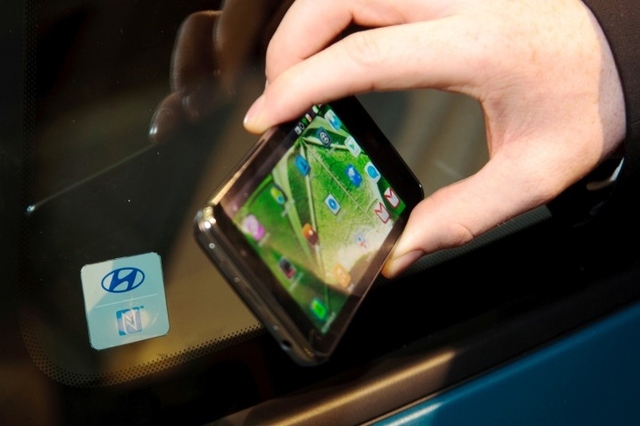 Based on NFC standards and utilizing cryptography such as Hitag-3 or AES-128, NXP’s KEyLink Lite enables car manufacturers to offer keys that connect to external NFC-compliant devices, such as mobile phones, tablets and laptops, for a “new driving experience,” according to the company. Car Finder – The car key records the GPS coordinates of your car’s last parking position, which can be read and recorded by an NFC-compliant mobile phone. When it comes time to return to your car, you can use your NFC phone to access a service such as Google Maps to download a vicinity map and help you locate the car. Route Planner – You can enter your destination in your home PC and transfer the data into the car key via NFC. Once you are inside the car, your destination will be automatically uploaded to the in-car navigation system. Car Status and Service Data Management – Before leaving your home or office, you can find out how much fuel remains in your car for your next journey by waving your car key over your NFC-compliant mobile phone. Additionally, the car key can save car service history, eliminating the need to keep paper files. Car Self-Diagnosis – Transfer diagnostic data from your car to a PC via the car key, then upload it to a service Web site and run a diagnostic analysis in seconds. Car Personalization – Car manufacturers can pre-fit cars with upgraded services, which can later be unlocked in the field. Obtain permissions from your car manufacturer and store the permission for the new features onto the car key. All new features will be automatically activated the next time you enter the car. The KEyLink Lite solution also features NXP’s Keyless Entry interface, including a LF 125 kHz front-end for the immobilizer and Passive Keyless Entry/Go systems, as well as a low-power, high-speed RISC core with up to 32-kB user EROM for customer applications and 6-kB EEPROM for application specific user data.